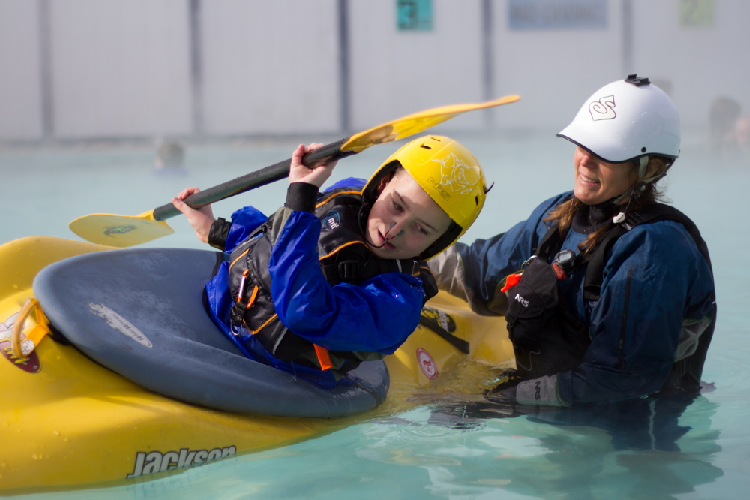 Taking advantage of your local pool or hot springs to work on paddling fundamentals is always a great idea, but in the winter it is a treat. 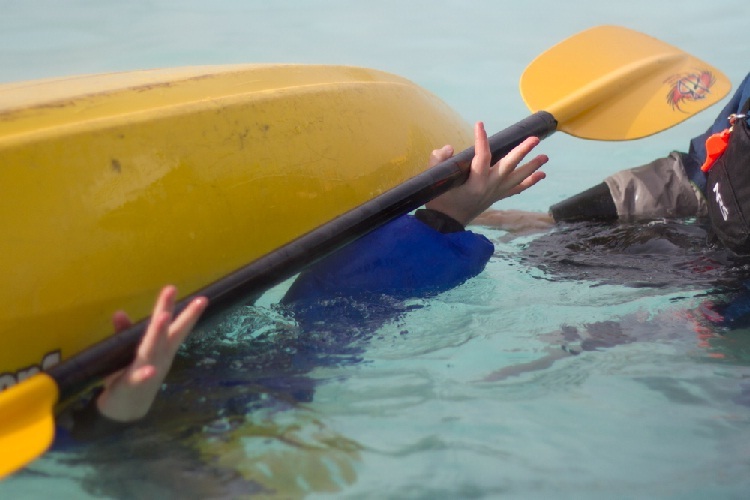 As an American Canoe Association (ACA) instructor, I often hear the words “I can roll in the pool” as a swimmer is collecting their gear after a wet exit in the river. Here are a few tips to help you work on your whitewater roll in the pool. When you’re working in the pool, you know your surroundings. You’re not worried about any hazards downstream, boils pulling on your paddle or boat, or cold water shocking your system as you flip over unexpectedly. As you begin your next roll session at the pool, try some of these strategies to mimic what it feels like when you are rolling in whitewater. Wear a splash top, life jacket, and a helmet. Also, if you paddle in the cold water, spend some time practicing while wearing your gloves, mittens or pogies in the pool. You want to help condition your body to the same experience you will have in whitewater. Pulling your head up? Well, there are lots of reasons for this, but wearing a skullcap and ear plugs helps protect you from the shock of the water. This will help make you more comfortable, giving you a little more time to establish your perfect setup. Having trouble with your setup? Take a moment to ensure that you have loose hands before you begin your roll. Here, Quinton is making sure his grip is loose. This is essential to making sure you are ready to roll. Paddle diving? Having loose hands in your setup reminds you not to pull down on your paddle. A diving paddle blade is most often caused by a tight grip where the paddler pulls the paddle down in an attempt to raise their body and head up. A tight grip can also change your blade angle, which sends it diving down instead of leaving it on top of the water. Instead, push up on your paddle through the sweep or C to C roll. Not confident you will come up? Work on rolling with resistance. You’ll need a friend who can apply pressure to the bow or stern of your boat. By holding their hands on your boat you’ll feel similar resistance to whitewater. Once you can roll up with your friend’s resistance, you will nail your roll in whitewater every time. Always practicing from the set up position? Once you are rolling with resistance, try flipping upside down from every possible position you can imagine. Rarely, in whitewater paddling, do we flip over in the setup position, but this is how we most often practice our roll, myself included. Try flipping over with one hand on your paddle or with your paddle in the vertical position. Your mind goes blank when you tip over? Sometimes I hear people express that when they flip over they forget everything. Practice will help this, but having a mantra does as well. I came back from Chile in 1994 and headed to the Lochsa. I had run the Bio Bio self-support before it was dammed, and the waterfalls on the Rio Claro. I’d had the time of my life in Chile, but, back on the Lochsa, I could not roll. Pete Newport, co-owner of Sawyer Paddles, took me to the pool. He introduced me to rolling with resistance and having a mantra. My mantra, loose hands, push (up during my sweep), snap! My body knows the routine, but having a mantra gives my brain a job — a productive job that helps me roll. A mantra gives your head a positive message to focus on. Hope to see you in the pool and on the river! Photos courtesy Will Stauffer-Norris. Special thanks to Zims Hot Springs for the use of the pool.